Note: The product tested in this review was sent to me by Queal on my request, free of charge, in exchange for an honest and unbiased review. In the world we live in, we tend to optimise everything as much as possible. However, until recently, there’s one area that was left rather untouched: food. Food has always been a rather sensitive subject; just look at what happens when someone tells their friends they are going vegetarian, or vegan: they all suddenly have a nutritionist degree. In the end, everyone is forgetting the primary utility of food, which is getting your body the nutrients it needs. This can be done in a number of different ways: with or without meat, with or without any actual eating, etc. What would happen if you were to create a product that holds 100% of the daily amount of essential nutrients, as set out by EU regulations? That’s exactly what the people at Queal set out to discover. 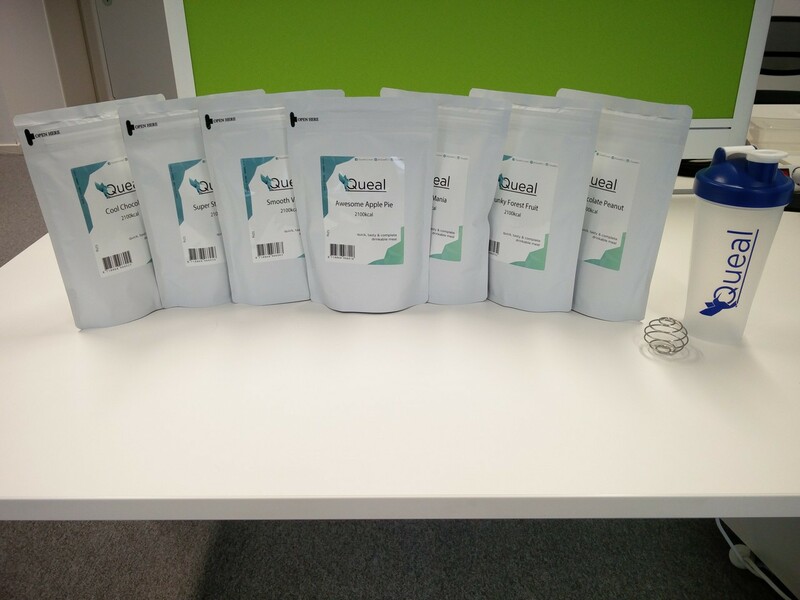 Queal is yet another variant of the popular US-based Soylent. The idea is to replace your meals with healthy shakes, which contain everything your body needs. While the idea of drinking shakes instead of eating ‘normal’ meals may sound strange or even unattractive, some people don’t especially enjoy eating food, and sometimes you’re just lacking the time (or will) to cook yourself a proper meal. To me, this is exactly where Queal comes in; as a healthy replacement to the good old pizza or other take-out. Moreover, if you think about it, humans have already done this for quite some time, just… not for humans. That’s right, I’m talking about cat food (or dog food, if you’re more of a dog person). After all, if it’s possible for our pets, why wouldn’t it be for us? That’s exactly why meal substitutes like Queal have intrigued me for quite some time. I just had to try it for myself. So, one night, I decided to order Queal’s Taste Tester package. Just as I was about to place my order, I figured I could try to ask them for a free sample in exchange for an honest review, which I told them would hopefully be positive, but I clearly pointed out that wasn’t in any way guaranteed. The CEO responded the next day before noon, asking me for a shipping address and some other information. I received my package on Tuesday, which was pretty quick. Each bag contains a day's worth of meals. All those ingredients are sourced from the European Union. Queal is also compatible with a vegetarian lifestyle and contains no GMOs. It is not vegan, however, since it contains Whey Protein, which is a byproduct of the cheese-making process. While Queal contains maltodextrin, the overall glycemic index (GI) of Queal is below 70, which is the glycemic index of whole wheat bread, or raw banana. This means it is not absorbed by the body too quickly, giving you plenty of energy throughout the day. For anyone interested, the full nutrients table is available on their website. It’s interesting to note that all flavourings are 100% natural. This means the Cool Chocolate flavour comes from added cocoa, the Super Strawberry one from dried strawberry powder, etc. What follows is a detailed description of all the tastes I tried, which is all of them except Morning Macchiato, since this last one joined the party only a few weeks ago, which means it’s not in the Taste Tester yet. Taste The first taste you get is wheat, followed by the forest fruits. After that, you get a quite vegetal taste that resembles alfalfa germs, which I find to be quite an awful finish. Taste A mix of wheat and chocolate that also has a sort of alfalfa sprout finish, but significantly less noticeable than with the Funky Forest Fruit flavour. Taste Just like a cereal bar with apple, from start to finish. Taste Banana from start to finish, which is a pretty standard taste for a shake. Taste Strawberry from start to finish, which is once again a pretty standard taste. Those ratings are obviously subjective; other people’s experience might differ. My girlfriend, for instance, tasted Crazy Chocolate Peanut first and, while it was a taste I enjoyed, she didn’t like it at all and ended up buying herself a sandwich. With the taste out of the way, let’s get to what it’s actually like to drink Queal. Let’s start with the preparation, which is quick — a must, since ‘Queal’ is a contraction of ‘quick’ and ‘meal’ — and easy. 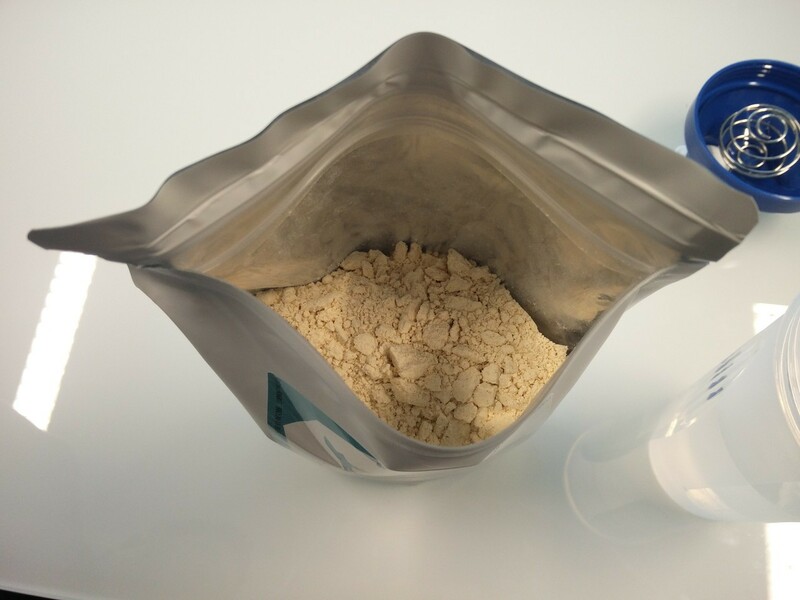 Preparing Queal is as simple as filling the shaker with 300 to 400 millilitres of water, adding about 3 scoops of powder using the provided measuring scoop, dropping in the mixing coil, closing the shaker and shaking it vigorously for about 30 seconds. It can then be drank straight away or put in the fridge for later use. 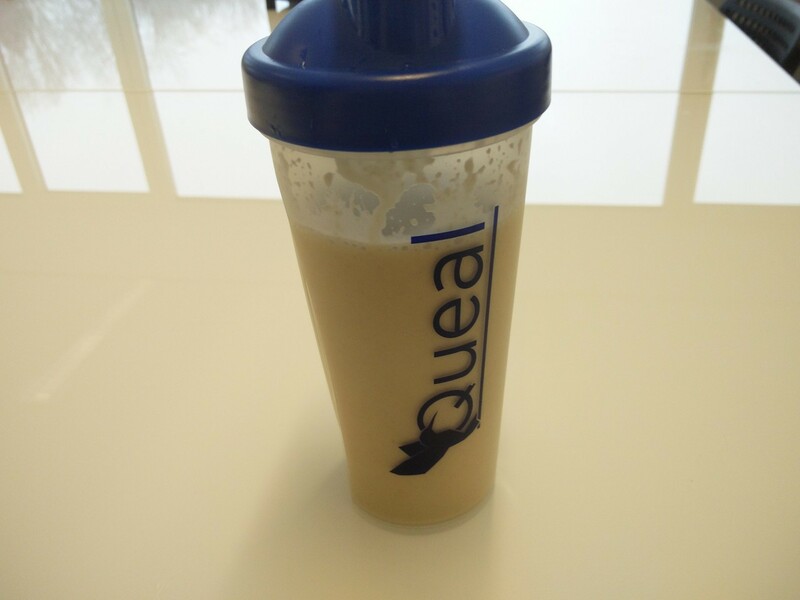 Since I generally tend to eat smaller quantities than most, I only use 200 to 300 millilitres of water and 2 scoops of Queal for my shakes, which turns out to be the perfect quantity for me. The inside of a bag of Funky Forest Fruit. 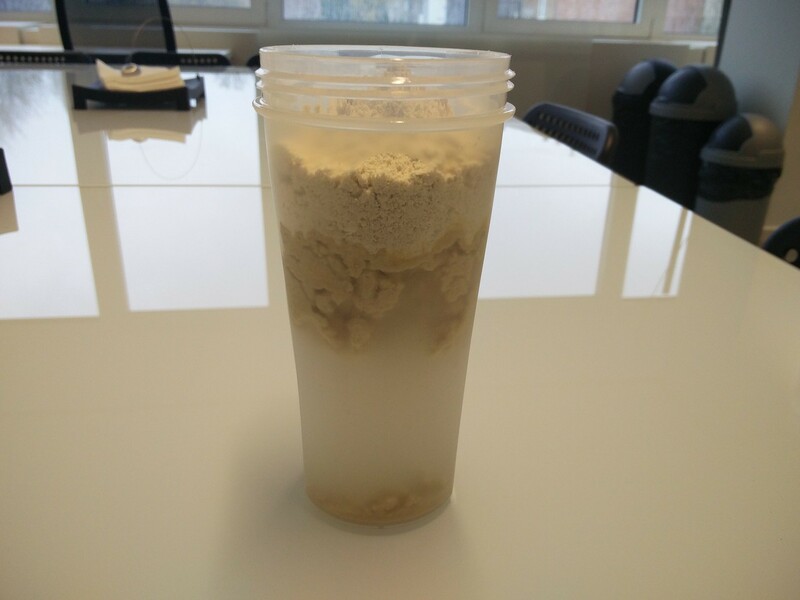 The shaker, filled with 300 to 400 millilitres of water and about 3 scoops of Queal. Queal floating on top of the water. The mixed product, ready to drink. After drinking Queal, you definitely feel full, but not the bad kind of full. You’re not suddenly tired because your digestion is starting to kick in, as is common with regular meals. Thirty minutes after finishing your shake, you feel energised — and I mean really energised; I felt as if I had consumed some kind of energy drink, which was of course not the case. 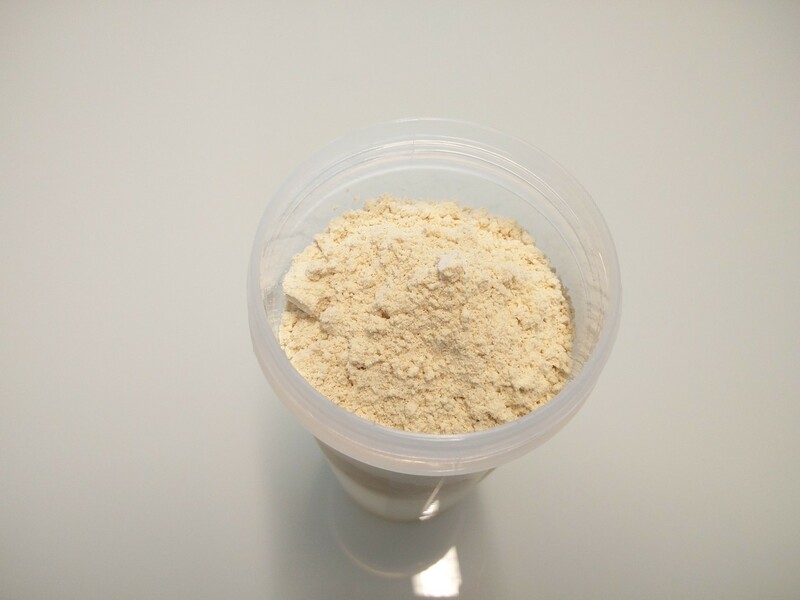 One shake is enough to provide you with a feeling of satiety and energy for several hours; more than enough to last the morning or afternoon without any cravings, which often isn’t the case for me with a normal meal. As an example, one day I drank my shake around 1.30 PM and lasted effortlessly until 8 PM without any other food intake. I also tried a day entirely on Queal, which was really great. Again, I had no cravings whatsoever and had plenty of energy throughout the day. Queal also didn’t seem to disturb my digestive system at all, which was something I dreaded a bit. It also seems that I tend to sleep better than usual when drinking Queal at night. All in all, this test was a really positive experience. Queal will definitely replace some of those pizzas and other frozen foods I would use when I’m too lazy or tired to cook for myself. It won’t always replace them, of course, since sometimes there’s just nothing like a good old pizza. In a way, Queal might also encourage me to pay a bit more attention to my food, now that I know how amazing it feels to have a balanced diet. One last thing that was left out until now is the price, which is rather low, with a mere €2.10 per meal. Queal definitely fulfils its goal of providing quick, healthy and wallet-friendly meals. For anyone interested, following this link will get you a 5% discount. I’ve also managed to get an extra 5% discount code, making the total discount 10%; just use the code QRF03139BF3 at checkout. Update: since publishing this review, Queal improved their recipe and came up with a new product. You can read all about it in my update review. This Could be the Future of Fast Food by Pierre-Louis Peeters is licensed under a Creative Commons Attribution 4.0 International License. If you enjoyed it, perhaps share it with people you know? If you wish, you can also support the writing of these posts. Subscribe or follow me on social media using the buttons below. Subscribe now — It's free!